Time magazine has partnered with Foursquare for the Republican and Democratic National Conventions. The Republican Convention, which kicks of in Tampa, Florida today after being delayed by a day due to the threat of a topical storm, sees Mitt Romney formally nominated as Barack Obama's White House challenger. The Democratic convention is due to begin next week. Time magazine, which has more than 60,000 'likes' on Foursquare, "has the exclusive partnership with Foursquare for the summer political conventions", Cathy Sharick, managing editor of Time.com told Journalism.co.uk. The US-based magazine and news site is using Foursquare to provide a "behind the scenes" view. Time is checking in, sharing geolocated tips and reaching out to new followers, who can earn convention badges. The news outlet is also encouraging Foursquare users to use its Foursquare app, which provides a news feed of Time content, and has created a map displayed on Time.com which shows the location of those who have checked in. 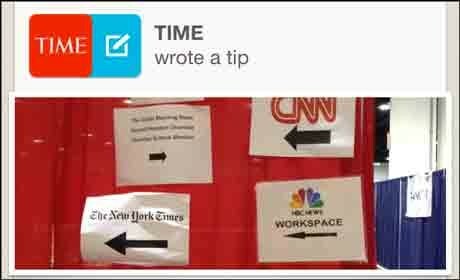 Time magazine has been using Foursquare in other ways too: to share updates from reporters on the road, as well as to add historical Time covers to national landmarks. For example, here is an example check-in from political columnist Joe Klein's road trip and here is a Time cover from the archives.